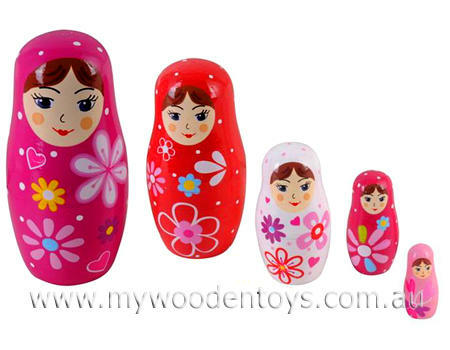 Russian Nesting Dolls Baboushka are a set of five traditional nesting dolls decorated in lovely pink and white colours. These dolls are an endless source of fascination and opening them and finding more and more little people inside is great fun. Each nesting doll is different and has a nice shiny varnished finish. As with all Russian nesting dolls each one fits neatly inside the other from biggest to smallest. A great toy which has been around for generations. Material: Wood with child-safe paint . We like this because: "Just imagine how many children have been entertained by toys like these."